The first amendment to the United States Constitution is clear: neither free speech nor the freedom of the press can be infringed upon by Congress. Freedom of the press is a right which the Constitution itself has protected since 1791. Why would that be? As journalists, we have been given a great responsibility to fill the role of the “fourth power.” This is to say that in today’s democracy, which includes the executive power, the legislative power, and the judicial power, the power of the press is to inform the citizens so that they can make the best decisions about their government and about their lives. At La Voz, we have been doing our part since 2004 to build an informed, Spanish-speaking public in our region of the Hudson Valley (and now in the Catskills as well). We have published many articles that help us to understand this part of the world we have chosen to live; for example, on issues ranging from New York health care and emergency preparation, to scholarships for Hispanic students, to solar panels and electric cars, along with countless other important topics. 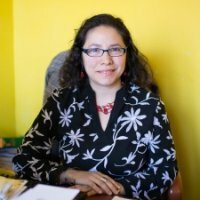 We have published innumerable stories that reflect immigrants’ versions of the American Dream (immigrants who live in any of Dutchess, Ulster, Orange, Columbia, and Sullivan counties) including Sara Flores of El Salvador, Elva Margarita Corbatón of Mexico, Elmer Martínez of Guatemala, Evelyn Garzetta of Puerto Rico, Peter González of Puerto Rico, Mercedes Laínez of Hunduras, Liliana Panza of Ecuador, Marco Ochoa of Mexico, and many more. To visit our online archive and read the majority of our previous issues, go to lavoz.bard.edu/archivo. Not only do we bring our readers articles, interviews, testimonials, resources, and poems in our monthly print issues, we also maintain an active Facebook page, posting several times each day with the latest information on events, activities, and programs for the local community which we serve. We invite you to “like” our page so that you can stay informed all month long: facebook.com/LaVozHudsonValley. But that isn’t all; at La Voz, we organize panels at Bard College (our home), inviting experts to explain local issues of Latino immigration to English-speaking audiences who are eager to learn more about these issues. For example, in February we presented a panel about the Sanctuary Movements of the Hudson Valley. Over 150 people traveled from every corner of the Hudson Valley, from White Plains to Hudson, in order to hear our panelists (Podcast available here). In addition to the monthly publication, the Facebook page, and the panels for English speakers at Bard, La Voz helps to organize various community events, such as the Kingston Multicultural Festival, and the La Guelaguetza celebration in Poughkeepsie. We also attend several other events, and meetings, all working towards creating a stronger sense of community and belonging in every corner of our region. All this activity keeps us very busy every month and connects us with the news that our readers want to know more about. And how exactly do we pay for this undertaking? That’s a good question. To start, our home is Bard College, a liberal arts institution which provides us with a stable foundation. Moreover, thanks to our advertisers, La Voz has been published in color for the last year. But there is still much more work to be done, more news to cover, more information to share. This is why we need your help. For this reason, on June 25th, we hope to see you at the Spiegeltent at Bard College to celebrate another year of La Voz and to raise the funds that we need in order to keep doing our work. There are many ways to support La Voz, but this is the most fun and exciting! Visit tinyurl.com/LaVoz2017 to buy your tickets. If, for some reason, you cannot be present on Sunday the 25th celebrating with us and the Grammy-nominated salsa band New Swing Sextet, you can also make a tax-deductible donation by sending a check to La Voz- Bard College, 30 Campus Rd, Annandale-on-Hudson, NY 12504, or through the website: lavoz.bard.edu/donar. La Voz continues to inform, educate, and empower the Spanish-speaking population of the Hudson Valley. When White House strategist Steve Bannon tells the press to stay quiet, or when President Trump declares himself an enemy of journalism, we are only given more motivation to keep working. We only gain focus (as though we had lost it) to exemplify responsible journalism, and to fulfill our roll in democracy. If you like what you see, remember that this is yours too. Now it is your turn to join forces with La Voz.